Page 3. Who are the coaches? Page 4. Where they are playing. September 10. Second KHL season started with Opening Cup between two playoff finalist of last spring, Ak Bars and Lokomotiv. One more, Ak Bars pulled the victory and again Alexei Morozov played the biggest role in his team success. He scored two goals, including the deciding one with 9 seconds to go in overtime on power play. . . Check video section for more. HC MVD Balashiha come to a decision to cancel contract with 29-years old forward Joe Motzko. American, who played six games for Atltanta Trashers last season, could not impress HC MVD coaches during training competitions. Vacations for KHL’s players ended in the middle of summer - on July 23 almost all teams opened their training camps. Now, one and half month later, KHL is ready to drop puck for its second season. This time organization is a little different, all clubs are divided to four division by geographical location, rather than ranking. That will help to save some travel money on huge Russian territories and, hopefully for KHL administration, will aid to establish rivalry between neighboring teams. Overall, every club is going to meet their divisional opponents four times, and every other team twice, total for 56 matches. Eight best squads in East and West Conference will advance in Gagarin Cup playoff, where best two teams will meet in finals. Salary cup for 2009-2010 stayed on the previous level - maxim 620 millions rubles, minimum 200 millions, however each team have a right not to count contracts of two players with “Star” status. The parity in KHL is out of question - Salavat Yulaev, SKA, Lokomotiv, Ak Bars are having problems to get under cup, and at same time Lada and Vityaz just recently found enough financing to reach minimum. 1. Alexei Morozov F (Ak Bars) - since returning from NHL in 2004-05, Alexei became leader and super sniper for Ak Bars. It's not a coincidence, but eminent Morozov scored lonely goal in game 7 Gagarin Cup final last season. 2. Kevin Dallman D (Barys) - in his first season in KHL Canadian has rewritten Russian records for defensemen, and overthrown legendary Vyacheslav Fetisov from pedestal, after scoring 58 points (28+30) in 53 games. 3. Jaromir Jagr F (Avangard) - Czech superstar finished just eighth in KHL in 2008-09 with 53 points (25+28), but you must remember that he was playing for falling apart Siberian club. 5. Sergei Mozyakin F (Atlant) - 28-years old forward never played in NHL, but has a remarkable carrier in Russia. Last year he was first in regular season with 76 points (34+42) in 56 games. 6. Sergei Fedorov F (Metallurg Mg) - his return to Russia was second biggest news in Russia this summer after Hudler singing. Nobody expect from veteran miracles, but using unmatchable experience Sergei could still shine. 7. Vitaly Kolesnik G (Salavat Yulaev) - while fighting for starting position in Atlant with Ray Emery in 2008-09, Kazakstanstan netminder stopped 94.5% of all shots in 30 games - the best record in whole KHL. 8. Danis Zaripov F (Ak Bars) - playing together with Morozov, helped Danis improve his scoring touch. Last season - 34 goals and shared third place in the league. 9. Jan Marek F (Metallurg Mg) - became a scoring machine. Shared first place in previous KHL season with 35 goals. 10. Alexander Radulov F (Salavat Yulaev) - made a lot of noise by leaving NHL, but not completely reached expected heights in KHL. Nevertheless, had a lot of potential to be the best, if could deal with his temper. 12. Viktor Kozlov F (Salavat Yulaev) - had a chance to stay NHL, if not for Ufa’s crazy money offer. 13. Oleg Saprykin F (Dynamo M) - last season could not much his own record breaking numbers of 2007-08, but even then made a national team and won World championship. 14. 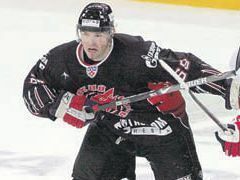 Vitaly Proshkin D (Salavat Yulaev) - one of most reliable defenseman in Russia - played for national team on six out of seven last World Championships. 15. Ilya Nikulin D (Ak Bars) - Atlanta Trashers still looking for magic act to sign skilled defenseman. 16. Vitaly Vishnevsky D (Lokomotiv) - everyone new about Vitaly’s physical play. In KHL he also started to generate offence - 21 points (8+13) in 53 matches. 17. Martin Prusek G (Dynamo Riga) - With 8 shutouts, Slovakian netminder was second in the league. With his phenomenal play, Martin totally responsible to taking Riga’s club to playoff. 18. Georgy Gelashvili G (Lokomotiv) - First goalie in KHL to win 30 games per season and then made a trip to Gagarin Cup final. 19. Karel Rachunek D (Dynamo M) - 30-years old czech was best in Dynamo Moscow in plus/minus category and best among defencemen with 30 points. 20. Yuri Hudler F (Dynamo M) - after limited role with Detroit Red Wings, will be ready to fulfill his huge contract with Dynamo. 21. Alexei Tereshenko F (Ak Bars) - playing in 2008-09 for Salavat Yulaev, shared fifth best record in the league with 58 points (29+29) and earned sport in Russian national team. 23. Pavel Brenld F (Torpedo) - playing for average team did not prevent Pavel to share best record in KHL in 2008-09 with 35 goals. 24. Mattias Weinhandl F (Dynamo M) - Swedish forward stand out during playoff with 16 points (6+10) in 12 contests. 25. Linus Omark F (Dynamo M) - 22-years old winger overgrow Swedish championship. Ready to prove himself in KHL before moving to America. 26. Johan Harju F (Dynamo M) - last couple years was inseparable with Omark, improving season by season. 27. Oleg Tverdovsky G (Salavat Yulaev) - the age and injuries started to take a toll on talented defenseman. 28. Albert Leschev F (SKA) - 38-years old veteran refuse to slow down, still can make a perfect pass. 29. Vasily Koshechkin G (Lada) - Man among boys, Vasily continues to stay in Togliatti, where because of financial difficalties roster reminds junior hockey team. 30. Sergei Zinoviev F (Salavat Yulaev) - great talent, hard personality. Hopefully head coach Bykov knows the road to Zinoviev’s heart. 31. Alexander Korolyuk F (SKA) - after a slow start for Atlant last year, picked up in the second half. Exploding speed and deadly shot is perfect combination for underachieving SKA. 32. Oleg Kvasha F (Atlant) - Experience and size made Oleg very noticeable on any team. 33. Richard Zednik F (Lokomotiv) - after 13 years in NHL will have to fill shoes left by Yashin in Yaroslavl. 35. Denis Kulyash D (CSKA) - still own the hardest slapshot in Russia. Improved skating and lowered his temper. 36. Martin Gerber G (Atlant) - could follow the “Emery Route” - one year in KHL and back to NHL. 37. Petr Cajanek F (SKA) - Wishing to get back the scoring touch in SKA after only 9 goals in Dynamo Moscow last season. 38. Daniil Markov D (Dynamo M) - NHL or KHL, Daniil always will play until last second and won’t spare himself or any opponent. 39. Ilya Proskuryakov G (Metallurg Mg) - Best rookie of KHL, made Metallurg’s season worth of reminder. 40. Sergei Zubov D (SKA) - former Dallas Star, he couldn’t believed himself, that he again in Russia. Must forget about last year injuries and return to previous shape. 41. Alexander Perezhogin F (Salavat Yulaev) - 28 goals and 24 assists last season but still not much talk about former Montreal Canadian. 42. Alexander Svitov F (Avangard) - having problems with scoring, but remains the heart and soul of Omsk team. 43. Dmitry Kalinin D (Salavat Yulaev) - always played much better for Russian national team than in NHL. Having Vyacheslav Bykov as head coach will eased transaction to KHL. 44. Stanislav Galimov G (Ak Bars) - young rookie outplayed last season Wade Dubielewicz and will again fight for starting position on the champion squad. 45. Zbynek Irgl F (Lokomotiv) - scored a lot playing with Yashin, now must prove that he could do it without him. 46. Ray Giroux G (SKA) - moving from Ak Bars to SKA was not the best step for Canadian defenseman carrier. 47. Andrei Nikolishin F (Traktor) - Despite being 36 years old, veteran still managed to have a best production among teammates in Chelyabinsk - 39 points (10+29) in 48 contests. 48. Branko Radivojevic F (Spartak) - Slovakian forward became a go-to guy in Moscow club. 49. Niko Kapanen F (Ak Bars) - Improved in every aspect after coming from NHL. 50. Andrei Pervyshin D (Ak Bars) - 24-years old almost double his production in 2008-09 compare to previous seasons - 27 points (6+21) vs 14 (7+7). Our coaches' ranking are based on their latest achievements and experience. Of 24 head coaches, 16 are Russian, two from Canada and Czech Republic, one from Finland, Latvia, Slovakia, and USA. Oldest is Czech tutor from Avtomobilist Ekaterenburg Marek Sykora, who will celebrate his 61st Birthday on November 11, 2009. Youngest one is forme NHL tough-guy 35-years old Andrei Nazarov, working with Traktor Chelyabinsk already third season. Predictions. Who will be fired first? 1 Vyacheslav Bykov (49) Salavat Yulaev Ufa Also head coach of Russian national team that won two last World championship. Has come to Ufa afterthree season with CSKA. 3 Petr Vorobiev (60) Lada Togliatti Has a huge experience on everypossible level with great record of success, including two Russian national championships in 1993 and 1997. 7 Vladimir Krikunov (59) Neftekhimik Nizhnekamsk Coached Belarus in Olympic Games 2002 and Russia in 2006. Conquer gold medal with Dynamo Moscow in national championship in 2005. 9 Glen Hanlon (52) Dynamo Minsk Head coach of Byelorussian National Team. . . +49-84-24 with Washington Capitals from 2003 to 2008. 12 Julius Supler (58) Dynamo Riga Slovakian tutor made Latvian club very competitive in its first season. 13 Sergei Kotov (59) Dynamo Moscow Great team lineup will help get over mediocre experience. 16 Sergei Nemchinov (45) CSKA Moscow After horror in Super series 2007, won two bronze medals with Russian junior teams at World Championship. 17 Andrei Shayanov (41) Barys Astana Last spring captured first place in Division I with national Kazakhstan squad. 20 Marek Sykora (60) Avtomobilist Last four years has worked with Czech junior national team. 22 Anatoly Emelin (44) Amur Had a share of success as assistant coachwith Lada in early 2000s. 23 Mike Krushelnyski (49) Vityaz Three times Stanley Cup champion withEdmonton Oilers in 1980s does not achieve much at coaching yet. * - Minsk is in the process of building of new ice arena for World Championship 2014, that will have a capacity of 15000 seats. ** - Being reconstructed for additional capacity. By KHL rules, the minimum capacity of home arena for any team is 5500 seats. However, the league never informed that law, just keep threatening Lada Togliatti of expelling. There are also some exceptions - for city with population less then 100000 people, the arena also could be less the minimum number. This rules is applied to Vityaz from small Moscow region city Chekhov. This summer the head coach of "Metallurgist" Novokuznetsk Dmitry Parkhomenko also had to perform functions of the general manager. He was responsible for a signing players for main "Metallurg', and also for junior team "Kuznetsk bears". Parkhomenko was able to save most of the players from last season and, as result, they helped “Metallurg” to win its first tournament in six years, taking first place at Belosokhov’s Memorial in Novosibirsk. 36-years Parkhomenko, thirds youngest coach in KHL, answered a few questions for league website. - Dmitry, this summer was different for you team comparing to last years. It was quiet, this time “Metallurg” did not lose two dozens players and accordingly did not sign 20 new guys. What happened on the transfer market? - There were enough free agents, but those lads were too expensive for our club. Also, we had many guys with contracts for the next season. In my opinion, everyone is very tired by annual players migration, when 15 new people were coming to the team, and same number are leaving each summer. At the end, we invited to Novokusnetsk goalie Alexander Viykhin, defencemen Artem Ternavsky and Irzhi Marushak. We also have a few players on temporary deals and will make evaluation on each individual after preseason games. - What do you think about KHL changing format of regular season, moving teams to four divisions by geographical location? - I think, during economic crisis this is valid decision. Now the teams will play more against opponents from nearest cities and save money on traveling. - Did you received from club administration the main target for “Metallurg” for upcoming season? - Officially it will be dome a few days before the season starts. For now we continue to prepare for our fist game against Sibir Novosibirsk September 11. Facts from KHL Review: In 2008-09 Metallurg Novokuznetsk had a great start, however slowly team slipped in standing and finished 21 place with +17(5)-31-8, 24 points behind playoff zone. Parkhomenko took over head coach position in May, replacing legendary Boris Mikhailov, who decided not to extend his contract. Prediction from KHL Review: Metallurg did not improve its line-up and basically did not have any chances to make playoff this year. As well, Parkhomenko is main candidate to become first fired coach in KHL in 2009-2010.